Amsterdam - The Old Church 1. This oldest stone building in town took 300 years in the making. By the mid 16th century the last aisles and chapels had been added. Nobody knows when the first wooden chapel was erected on an artificial mound on the eastern bank of the river Amstel. But not long after ±1250, when the dam in the river was built that would give the place its name, the chapel was replaced by a first stone church. Swiftly followed by a first tower. Both are still there, but integrated and partly hidden in the present construction. The church was the largest public building in town, and as such used for many purposes, not for religion only. It was a place for meetings and trade, the fishermen repaired their nets and sails here. The building of the New Church (early 15th century) on the other side of the river made little difference : the old one remained sort of a public living room for the city. All that changed in 1578 when the catholic church was taken over by the protestants, and thoroughly "cleansed" from superstitious statues, paintings and altars. Since then the aspect of the church did not change much. 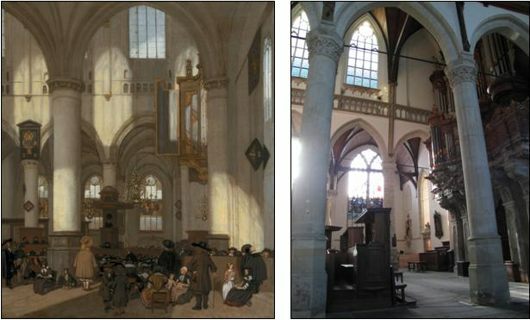 See 17th century painting below left, and recent photo. The Old Church was used as a cemetery for nearly 600 years. Up until 1865, over 10.000 people were buried inside. The handwritten tomb registers have recently been put in a database. The interactive ground plan of the graves is fascinating. The church was originally devoted to Saint Nicholas, the multipurpose patron saint of children & students, merchants & thieves, and above all sailors. That is why there are ship models hanging from the ceiling. A series of remarkable 15th century woodcarvings survived iconoclastic fury. They deal with everyday life and Dutch proverbs. I guess they still exist because people liked them ; they are funny and not of a religious nature. 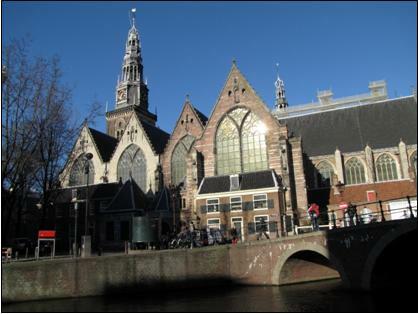 More on next page : Old Church & Rembrandt.